A lot has changed over the years when it comes to managing the adult in cardiac arrest. As a result, survival rates after cardiac arrest have risen steadily over the last decade. With the release of the American Heart Association ACLS Guidelines 2015 online on Oct 16th, while there aren’t a lot a big changes, there are many small but important changes we need to be aware of, and there still remains a lot of controversy. In light of knowing how to provide optimal cardio-cerebral resuscitation and improving patient outcomes, in this episode we’ll ask two Canadian co-authors of The Guidelines, Dr. Laurie Morrison and Dr. Steve Lin some of the most practice-changing and controversial questions. Cite this podcast as: Helman, A, Morrison, L, Lin, S. ACLS Guidelines 2015 – Cardiac Arrest Controversies Part 1. Emergency Medicine Cases. October, 2015. https://emergencymedicinecases.com/acls-guidelines-2015-cardiac-arrest/. Accessed [date]. The recommended chest compression rate is 100-120 per minute which is updated from the at least 100/min. The recommended chest compression depth is 5-6cm or just over 2 inches, but not more than 6cm as too deep can be harmful. 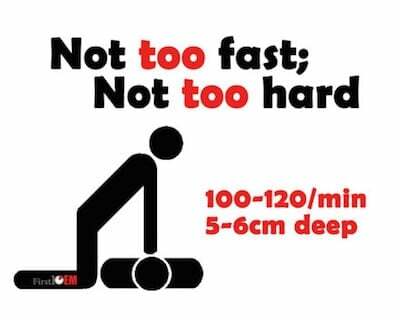 Use Audiovisual devices such as metronomes and compression depth analyzers which can be used to optimize CPR quality. The routine use of impedence threshold devices (ITDs) alone or mechanical chest compression devices alone are not recommended, however in out of hospital situations where manual compressions are difficult due to physical space limitations, mechanical devices may be useful. A recent RCT suggests that the use of the ITD plus active compression decompression CPR is associated with improved neurological intact survival for patients with out of hospital cardiac arrest. ECMO or ECPR may be considered for selected patients with refractory cardiac arrest where a reversible cause of cardiac arrest is suspected. Vasopressin has been removed from the algorithm altogether, and an emphasis on EARLY administration of epinephrine is stressed. Ultrasound has been added as an additional method for helping to confirm ROSC and for confirming ETT placement. Use maximum inspired oxygen during CPR and then after ROSC, titrate oxygen to an oxygen saturation of 94% rather than continuing maximum oxygen delivery. A low end tidal CO2 in intubated patients after 20 minutes of CPR is associated with a very low likelihood of survival, and this factor should be used in combination with other factors to help determine when to terminate resuscitation. The routine use of lidocaine after ROSC is not recommended, however the initiation or continuation of lidocaine may be considered immediately after ROSC from ventricular fibrillation or pulseless ventricular tachycardia. Emergency PCI is recommended for all patients with STEMI AND for hemodynamically or electrically unstable patients without ST elevation for whom a cardiovascular lesion is suspected. Do Targeted Temperature Management – recommendations have been updated with new evidence suggesting that a range of temperatures between 32 and 36 may be acceptable to target in the post cardiac arrest period, and an emphasis on fever prevention and treatment is stressed. Before we jump into the controversies it’s important to understand the basic theory of how best to achieve meaningful survival in the cardiac arrest patient. The concept of Cardiocerebral Resuscitation rather than Cardiopulmonary Resuscitation emphasizing high quality, minimally‐interrupted chest compressions to maximize blood flow to the brain, an important theoretical determinant of long term survival. Circulation-Airway-Breathing as opposed to the classic Airway-Breathing-Circulation is how we should approach these patients because of the realization that arterial oxygen saturation remains high for the first 5‐10min of a cardiac arrest, that recoil of the chest during chest compressions improves oxygenation, that delaying a definitive airway increases survival, and that high quality continuous compressions improves survival. In Toronto, the survival rate overall for cardiac arrest has improved from 2% in 2004 to 13% in 2015, probably related to improved early defibrillation and improved quality of chest compressions. The survival rate for Ventricular Fibrillation in Toronto has risen from 8% in 2004 to 35% in 2015. Caveat: because children usually die as a result of asphyxia and respiratory complications, early ventilations should be emphasized in the pediatric population. The recommended rate of chest compressions of 100-120 per minute, aiming for 110 per minute with audiovisual feedback such as a metronome (which is easily activated on most defibrillators), and the recommended depth of compressions is 5-6cm with visual feedback (which is also easily activated on most defibrillators). These recommendations are based on observational studies from the Resuscitation Outcomes Consortium (ROC) papers. The guidelines suggest a compression to breath ratio of 30:2, however in Seattle, the survival rates for cardiac arrest overall have remained around 19-20%, and for Ventricular Fibrillation are 44%, the highest in the world, possible, in part due to a revision of the compression to breaths ratio. Rather than the recommended 30:2 compressions:breath ratio, in Seattle, the paramedics provide continuous chest compressions. On the 10th compression, the provider handling the breathing gives a single 500cc breath, in between compressions, without any pause in compressions. The only time that Seattle paramedics pause compressions is to shock the patient, and even then, once they have determined that the patient is in ventricular fibrillation, while continuing compressions, they count down out loud and pause compressions for only a single, hands-0ff beat to re-administer a shock every 15 compressions until signs of ROSC are apparent. Experimental data out of England shows that, using gloves, the maximal energy delivered to a provider providing hands-on compressions without any pause for defibrillation is less than the average house hold electrical current, suggesting that hands-on defibrillation may be safe. 1. Have a dedicated experienced provider feeling for a manual femoral pulse during chest compressions so that as soon as a pause in chest compressions to assess for cardiac rhythm occurs at the end of 2 minutes of compressions, the pulse can be rapidly assessed along with the cardiac rhythm in less than 5 seconds (as apposed to less than 10 seconds as recommended in the guidelines). 2. Do not check for the pulse at all! Chest compressions should continue until your end tidal CO2 monitor shows persistent elevations. The argument here is that palpating for a pulse has been shown to be insensitive, not specific and have poor inter-rater reliability. One study showed that rescuer pulse palpation was only 78% accurate. Even if a pulse is felt, this does not guarantee adequate perfusion to vital organs. Dr. Morrison suggests stopping chest compressions only to assess for defibrillation and to defibrillate. An alternative to manual pulse checks suggested by Dr. Weingart in Part 2 of this series is to establish an early arterial line so that the moment a pause in chest compressions occurs, providers know if there is an increase in arterial pressure. Update 2015: Trial in NEJM compares continuous vs interrupted chest compressions (30:2) and finds that as long as the chest compression fraction is >75% then there appears to be no difference in survival to hospital discharge. Abstract. Analysis on The Bottom Line. Simulation training plays an important role in optimizing performance of cardiac arrest teams. Like NASCAR tire replacement teams, the cardiac arrest team should be proficient at performing their specific dedicated tasks. Observational data from the Resucitation Outcomes Consortium (ROC) show that the larger the cardiac arrest team the better the outcome. Where as previous guidelines focused on developing the skills of the leader of the resuscitation, current trends are to develop skills of each individual on the cardiac arrest team. 3. An increase of ETCO2 35-40 may indicate adequate tissue oxygenation and can be used to confirm return of spontaneous circulation (ROSC), however our experts recommend continuing CPR after the initial spike of ETCO2. In multiple randomized control trials mechanical CPR have not shown superiority to good quality manual chest compressions. The Guidelines recommend considering the use of compression devices in environments where manual compressions may be difficult or impossible due to physical constraints (eg: small cabins of some rescue helicopters). Mechanical CPR should be considered in situations where rescuer fatigue is a concern or prolonged CPR is anticipated, such as in a hypothermic arrest. Impedance threshold Devices (ITD) are circulatory devices which are applied to the endotracheal tube (ETT) or the bag-valve-mask (BVM) and increase perfusion to the right side of the heart. In a ROC study patients randomized to ITD vs sham ITD showed no superiority of the ITD. Some experts believe that the reason mechanical CPR devices have not shown superiority is because of inadequate training resulting in long chest compression pauses while placing the machine on the patient and hence decreased perfusion, but with adequate training that minimizes the pause in chest compressions while placing the machine on the patient, they may prove to be clinically superior to manual compressions in achieving ROSC and perhaps long term outcomes. Amiodarone 300mg IV bolus is still recommended as the antiarhythmic of choice for refractory ventricular fibrillation. In one study from the 1990’s comparing Amiodarone to placebo in refractory ventricular fibrillation, a higher rate of ROSC was achieved. In a study from the NEJM out of Toronto, pre-hospital ventricular fibrillation patients were randomized to amdiodarone vs lidocaine, and amidorone showed a higher rate of ROSC compared to lidocaine, however the death rate in hosptial in the amiodarone group was higher than that of the lidocaine group. Overall, survival at discharge from hospital was similar in both groups. The Amiodarone vs Lidocaine vs Placebo (ALPS) Trial is currently ongoing with a projected release in early 2016. 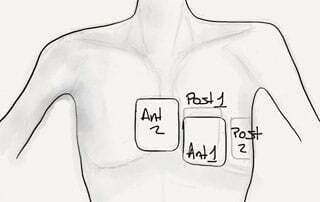 Dual Shock Therapy involves defibrillating patients who are refractory to multiple defibrillations with 2 defibrillators at the same time or within seconds of each other, one with pads set up in the traditional anterior positions and the other set up with anterior-posterior pad positions. A recent observational case series showed improved rates of ROSC with dual shock therapy with one patient surviving to hospital discharge. An RCT in 1989 by Bardy randomized patients with refractory ventricular fibrillation to dual vs single shock therapy and found no significant difference in ROSC. It is unknown based on current evidence whether the improved rates of ROSC with dual shock therapy are due to chance alone or due to the increase in energy or multiple vectors of energy delivered to the heart. Dual shock therapy for refractory ventricular fibrillation is not recommended in The Guidelines. Despite the lack of evidence that dual shock therapy improves survival, our experts recommend attempting it when other avenues have been exhausted in the patient with refractory ventricular fibrillation. Epinephrine has been shown in RCTs to improve rates of ROSC and admission to hospital, however one large pre-hospital study of Japan, while also showing improved rates of ROSC, showed worse 1 month survival rates with epinephrine. Update 2018: PARAMEDIC2 trial. A randomized double-blind controlled trial involving 8014 patients with out of hospital cardiac arrest (OHCA), demonstrated improved 30-day survival with epinephrine versus placebo, but had poorer neurologic outcomes at discharge and at 30 days. Abstract. The Guidelines recommend administering epinephrine as early as possible in the resuscitation. Observational data suggests that the first dose of epinephrine is administered at 22 minutes on average after cardiac arrest. Some experts believe that earlier administration in the first 4 minutes during the ‘circulatory phase’ of cardiac arrest may improve long term outcomes, but there is only observational data for this in the literature. One observational study of cardiac arrest with non-shockable rhythm compared epinephrine given at 1 to 3 minutes with epinephrine given at 3 later time intervals (4 to 6, 7 to 9, and greater than 9 minutes). The study found an association between early administration of epinephrine and increased ROSC, survival to hospital discharge, and neurologically intact survival. Some experts believe that the dose of 1mg every 3-5 minutes that is recommended in the guidelines is too high a dose, is too frequently given and may be detrimental. Epinephrine, in the doses used in cardiac arrest, causes cerebral vasoconstriction that may impair tissue oxygenation, brain perfusion and compromise neurological recovery. Scott Weingart describes titrating epinephrine in cardiac arrest to hemodynamic parameters and end tidal CO2 in this EMCrit podcast, and in Part 2 of this podcast. Titrating to diastolic BP, as described in the Paradis study in JAMA requires early placement of an arterial line during ongoing chest compressions. While end tidal CO2 is an excellent marker for chest compression quality and determining ROSC, titrating epinephrine to end tidal CO2 goals have never been shown to be associated with long term outcomes. A physiologic measure of brain oxygenation measured by near-infrared spectroscopy may be a better marker to titrate epinephrine to in cardiac arrest, but currently there is no evidence in the literature to support its use. In most patients in ventricular fibrillation the primary cause is an MI. Some experts believe that we should lower the dose of epinephrine in patients with ventricular fibrillation as a the primary rhythm during cardiac arrest to minimize the vasoconstriction of the coronary arteries caused by epinephrine given at 1mg every 3-5 minutes. In patients with non-shockable rhythms (PEA, asystole), early administration of epinephrine may be more beneficial than in patients’ whose presenting rhythm is ventricular fibrillation. Vasopressin is difficult to draw up compared to the pre-filled epinephrine syringes and has not been shown to be superior to epinephrine in terms of survival benefit in cardiac arrest patients for out of hospital cardiac arrest. It has therefore been removed from The Guidelines. The Guidelines do state that vasopressin may provide some benefit when administered with steroids and epinephrine in treating in-hospital cardiac arrests. However, routine use of this bundle is not recommended. This was based on a controversial study in 2013 out of JAMA in Greece with 268 patients which showed that the combination of vasopressin, epinephrine and steroids significantly improved survival to discharge with good neurological outcome compared to only epinephrine and placebo. However, our experts suggest that due to methodological flaws in the study, they cannot recommend it’s routine use as per The Guidelines. Kudenchuk PJ, Brown SP, Daya M, et al. Resuscitation Outcomes Consortium-Amiodarone, Lidocaine or Placebo Study (ROC-ALPS): Rationale and methodology behind an out-of-hospital cardiac arrest antiarrhythmic drug trial. Am Heart J. 2014;167(5):653-9.e4. Dorian P, Cass D, Schwartz B, Cooper R, Gelaznikas R, Barr A. Amiodarone as compared with lidocaine for shock-resistant ventricular fibrillation. N Engl J Med. 2002;346(12):884-90. Hagihara A, Hasegawa M, Abe T, Nagata T, Wakata Y, Miyazaki S. Prehospital epinephrine use and survival among patients with out-of-hospital cardiac arrest. JAMA. 2012;307(11):1161-8. Murkin JM, Arango M. Near-infrared spectroscopy as an index of brain and tissue oxygenation. Br J Anaesth. 2009;103 Suppl 1:i3-13. Mentzelopoulos SD, Malachias S, Chamos C, et al. Vasopressin, steroids, and epinephrine and neurologically favorable survival after in-hospital cardiac arrest: a randomized clinical trial. JAMA. 2013;310(3):270-9. Dr. Morrison mentions a video from the Seattle EMS that demonstrates a 1 second pause for defibrillation during CPR. I am having trouble finding it, but would love to use it for teaching. Any chance she has a link she could share with us? First… thank´ s for that great podcast. Second; I am also interested to get the video about that short pause for defibrillation. The one and only thing I have a little concern is the statement about the PARAMEDIC2 trial in UK. I think that´s exactly the trial we need. As mentioned there is no (zero) evidence that epi has benefit for better outcome. There are some concerns that epi does some harm. Al studies show that there is only higher ROSC at scene and survival to hospital but not discharge. But one larger shows that the survivors which got epi have a worse cerebral outcome. I don´t believe that we will get good and great studies for titrated epi in the near future neither that we will be able find the right dose for each one patient in arrest. So for me the main question is really – do patients with epi or without epi get better outcome (with good cerebral function). The goal must be always good neurological function not just hospital discharge. That will not be patient or family centered care in my few. If the PARAMEDIC2 trial shows that patients without epi during CPR have that better outcome; skip it! Hi Juergen. Your comments are very insightful. I see your point that if long term outcomes are no better or maybe even worse for patients in cardiac arrest receiving epinephrine, that it would be reasonable to skip it (accepting that you are going against the guidelines which may get you in trouble if you are reviewed). However, I don’t think that we should give up on epinephrine altogether. I do hope that with future research looking at timing, dose and presumed underlying diagnosis, that we may find that epinephrine has some long term benefit in cardiac arrest. Fingers crossed. I’ll be interviewing Scott Weingart in the next few days about titrated epinephrine, which might shed some more light on this controversial topic. I hope to release the interview in Part 2. As far as the video goes, I searched youtube for it and wasn’t sure which video Dr. Morrison was referring to. I’ll try to chase it down for you. Impressive podcast. One question that I’m looking for more information on: What is the role of arterial lines in cardiac arrest regarding goal-directed cardiac arrest? Other than the technical difficulty of placing a non-sterile line in the femoral artery (they can be removed after ROSC), has this been done and is it worth doing? Great question. Weingart partially answers it in part 2 at the end of the podcast and goes more into detail on his podcast on goal directed epinephrine dosing here http://emcrit.org/podcasts/hemodynamic-directed-dosing-epinephrine/. At my shop our RTs place most of the art lines and they usually aren’t present initially for cardiac arrest cases, so we are starting to look into cardiac arrest teams to ensure efficiency of the whole process and allow for art lines in a timely manner. As we know the emphasize is on no interruption in chest compression (cp) and base on guideline we have to stop cp after 30 compressions to deliver 2breathing while with advance airway we can continue cp with no interruption . Devices like LMA does not need any interruption in cp for insertion and dr Morrison mentioned about advance airway after 6 minutes or 3 cycle of cp so what is the logic of waiting 3 cycles for inserting LMA while with LMA we can eliminate the interruption in cp . In other word even with good breathing through BVM we still need to stop cp for delivering the breathing but with LMA no need for interruption so why any delay ? While it’s true that the BLS guidelines state 30:2 compression to breath ratio, what Dr Morrison is suggesting both for BLS and ALS is not to stop compressions for breaths, but rather to deliver the breath every 10 cycles of compressions in between compressions as they do in Seattle EMS. With regards to definitive airway, the idea is that we don’t need to rush to establish a definitive airway – we can wait up to 6 minutes. 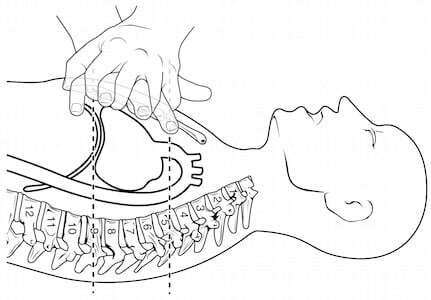 Placement of an LMA is a perfectly reasonable option assuming there is no pause in chest compressions during its placement. Thanks for listening! With even new ACLS 2015 guideline we still need to do 30:2 cp to breathing if there is no advance airway .right ? It means 4 times of pauses in 2 minutes cycle . I don’t understand the reason of deemphasizing of early advance airway ( like LMA with no pause in cp ) in guidelines while we can prevent of these pauses by inserting LMA or similar in first 30 seconds . Can you use quantitative capnography while doing bag mask ventilation?